There isn’t any baseball topic that is more of a cop-out, more of an admission that the author is flat out of ideas, then penning an article about one’s opinions on the Designated Hitter rule. I’ve managed to write roughly three posts a month for eight years without going there, so you’ll have to excuse me this one time. Allow me to put my bias on the table upfront: I support the DH rule. I don’t think it is a perfect rule, but I think that baseball is a better game when the rules recognize that the defensive primacy of the pitcher has resulted in a systematic offensive deficiency. I do not demand that the DH rule be expanded to the National League, but I would certainly not oppose it and would strongly oppose any effort to eliminate the DH from the American League. I’m not arrogant or naïve enough to believe that I have unearthed some new angle on this topic that you haven’t read before. The DH debate is relatively common, usually picking up extra momentum during interleague play and the World Series, and a large proportion of baseball fans have a strong opinion about it one way or the other. It now has entered the zeitgeist thanks to perpetual interleague play and the notion that universal adoption of the DH is inevitable. The first is that participants in a DH debate sometimes accusingly point out that DH proponents tend to be fans of AL teams (or, from the other side, that proponents of pitchers batting tend to be fans of NL teams). It is undoubtedly true that this is the case…but so what? Whenever subjective preferences are on the table for human beings, there’s a good chance that one’s formative experiences or familiar experience will be reflected. To the extent that something is a matter of subjective preference without the insertion of any logical process, does where the preference arises from really matter? And if facts and logic are introduced into a discussion, does the background of the person presenting them matter? Facts are either true or not, and logic is either sound or faulty. The second is the use of the "real baseball" card...namely, that baseball is somehow not baseball if pitchers are not allowed to bat. I’m not sure there’s a pro-DH counterpart to this argument; there certainly are specious arguments made in favor of the DH, but DH supporters generally don’t try to say that it’s not really baseball if pitchers bat. Arguments of this type are a convenient way to avoid making any sort of logical defense of one’s position. One of the worst arguments put forth by DH supporters is that "Everyone uses the DH except the National League and the Central League". It’s true, more or less, but it’s still an appeal to the majority. The fact that the DH is widely adopted is evidence that many decision makers felt that it was a good idea, but that doesn’t necessarily make it so. This argument is the pro-DH answer to the "tradition" argument of the anti-DH diehards. Of course, I’m not above snark and derision myself, and while I’ll try to avoid that for the rest of the post, I can’t pass this one up. You will occasionally see the claim that the DH rule exacerbated the decline of pitcher’s offensive production, and that pitchers did not or were not on a path to become the offensive zeroes they are in modern MLB until the DH rule was implemented. To this I say: nonsense. There are only two things constant throughout the history of major league baseball: the National League tries to position itself as morally superior to its rivals, and pitchers hit worse with each subsequent generation. By 1972, pitcher hitting (in terms of RC/G relative to the league average, which I call ARG but his conceptually similar to OPS+ or wRC+) had already declined to levels near where it is today; for 1963-1972, the yearly averages were 10, 8, 7, 13, 7, 4, 11, 13, 14, 12. This was a continuation of a trend--pitcher ARG had never dipped below 20 prior to 1952, below 30 prior to 1934, below 40 prior to 1903--with each generation, a new low was being reached, and the race to the bottom was accelerating. (See this post for a more detailed look at positional offense in the twentieth century). Pitcher ARG has declined further on average since the DH was introduced, but none of the observed figures would look particularly out of place in the 1963-72 figures. I suppose one must acknowledge that it is possible that the post-DH decline is understated due to the possibility that good hitting pitchers are more valuable to NL teams and thus get a greater share of pitcher plate appearances, but any such effect would have to be quite small unless the other forces at work were reversed or strongly diminished. A more popular argument against the DH is that it represents a fundamental change to the rules of baseball, a radical and unnecessary departure from the game as it was played for a century. (This is the refined, non-inflammatory version of the “real baseball” argument). Sometimes special attention is given to the first rule in the book, 1.01, which starts "Baseball is a game between two teams of nine players each". Since the DH is a tenth player, this rule is violated, and it is the first rule and thus the DH is completely antithetical to baseball itself. 1. The baseball rulebook is not the Constitution. If you somehow demonstrate that the DH violates rule 1.01, then rule 1.01 can be revised just as easily as the DH can be added. 2. Read literally, nine players doesn’t leave room for substitutes of any kind. OK, you say, what it’s trying to impart is that there are nine players in the lineup for any one team at any time. If that can be read into the rule, then why can’t you just read it as nine players in any particular half-inning? After all, the DH does nothing to change the fact that there are nine players in the field and nine players in the batting order; it simply allows two players to alternate between an offensive and defensive role while sharing one lineup spot. The rules prevent these two players from ever being active simultaneously (viewed from a half-inning perspective). Getting back to the more general issue of the DH being a radical rule change, I’m not going to try to argue that it’s more or less of a change to the rulebook than other changes that have occurred over the years. I am going to argue, however, that there have been many other changes to the game that have done much more to alter the way baseball is played than has the DH rule. Certainly the dawn of the “live ball era” changed the game much more than the DH, despite not being directly traceable to any rule change. (There are rule changes that certainly contributed, like banning the spitball and requiring clean balls in play, but there is also the composition of the ball and the approach of batters, both things that are not decreed by a line in the rulebook but can change the way the game is played). The offensive outage of the 1960s that served as the catalyst for the DH rule is another example, and one which it could be argued was more of a direct result of a rule change (the expansion of the strike zone). Many would argue that changing the definition of the strike zone is not as radical of a change as introducing the DH, because it was simply a tweak to a pre-existing element of the game. My contention is that the amount of actual change to the game caused by a rule change is not necessarily proportional to the perceived radicalness of said change. The ultimate example of this is the way that the usage of pitchers as pitchers (not as hitters as in the case of the DH) has constantly changed throughout the game’s history. I’m not opposed to tradition. If something has been done a certain way for a long time, and the end result has been favorable, I have no problem accepting tradition as a point in its favor. But it’s just that--a point, not a game, set, or match. Tradition is also a very dangerous argument to make at this stage in the game if you hate the DH, since nearly forty years of the DH is in the American League has to make the tradition argument close to ripe for those who’d like to keep it around. I have more to say on tradition, but it ties into the ultimate reason why I support the DH, so I’ll hold off for a second. Proponents of the DH like to claim that it introduces more strategy to the game; opponents sometimes argue the opposite, often citing Bill James’ article in the Historical Baseball Abstract that pointed out the higher standard deviation of sacrifice attempts in the American League. I’m not eager to take a position on which side (or either) is right. I’d grant that it’s probably true that the pitcher being forced to hit introduces more choices for a manager; but some of those choices have obvious answers. If you like strategy, is it more important to have many points at which a choice must be made, or more variation in the choices that are actually made (assuming for the moment that the DH actually does that)? However, the debate about strategy takes for granted more fundamental questions: what is the optimal amount of strategy in a baseball game, and what exactly constitutes strategy? One could posit that there are three basic types of strategy, which I’ll label by the people responsible for making the choices. I suppose Bill James would want us to consider a fourth level, Commissioner-level, which would be relevant to a discussion of the DH, but I’ll ignore that because it’s not particularly relevant to the game on the field. Sabermetricians have spent most of their time, historically, on GM-level strategy, with Manager-level strategy second. Investigations into player-level strategy have increased in recent years, particularly with the flowering of Pitchf/x data, but still lags behind the other two. The digression was probably unnecessary, except to set up my opinion--GM strategy fascinates me, player strategy is beyond me, and managerial strategy is interesting but there can be too much of it. Giving the manager more strategic options only interests me if those options allow baseball players to demonstrate their excellence. Even then, it can be too much. While managers sometimes go overboard in their attempt to utilize their relievers in an attempt to gain the platoon advantage, in theory it’s a good idea. That doesn’t mean it makes for compelling baseball as a spectator. At least in that case, players are being used in a manner that most efficiently converts their ability to value, and the players are better than their peers at the task they’ve been assigned. While the former might be true when strategic choices are made with respect to pitcher hitting, the latter is not. Pitchers are not world-class hitters, and even the lowliest defensive specialist position player would be a standout hitter for a pitcher. From where I sit, even if I accept that forcing pitchers to hit adds manager-level strategy, I don’t see that as a good thing. I’d rather see players asked to do things they excel at than watch a manager try to make the best out of a player who has no real talent at the task he is forced to engage in. I don’t begrudge those baseball fans who think that pitchers hitting should be a part of the game at its highest level. While I would prefer not to ever have to watch a pitcher hit, I’m fine with the status quo. I believe that the DH rule is a correction to a fundamental flaw in the initial design of baseball (to the extent that baseball was "designed"). Initially, the pitcher was a facilitator of action, more like a beer-league softball pitcher than a Greg Maddux. Of course, this lasted for about five seconds--competitiveness ensured that the rules constraining the pitcher would be constantly assaulted until the latter part of the nineteenth century when the rulemakers finally raised the white flag. I contend that the balance between offense and defense that supporters of pitcher hitting sometimes cite has never existed in baseball and was never possible in a game in which one player’s defensive responsibility so dwarfs that of his teammates. A shortstop certainly has more defensive responsibility than a first baseman, but the difference is not so great as to make the shortstop’s offense a trivial matter when evaluating him as a player. The difference is not even so great as to ensure that when selected in practice, individual shortstops always hit worse than individual first baseman. With respect to the pitcher, though, the value placed on hitting has been in decline from the beginning of professional baseball. Beyond the importance of selecting pitchers who can retire opposing batters, the relatively unabated trend of pitcher workloads declining with time has reduced the number of plate appearances an individual pitcher gets. At first pitchers were everyday players, more or less, and then there were two-man rotations and three-man rotations, and then the pitchers stopped completing all of their games, and there were four-man rotations...well, you know the story. Natural selection (I’m sure my use of this term leaves a lot to be desired if you happen to be an evolutionary biologist) dictates that when one trait is so important, it will dominate, and pitching dominates in the selection of pitchers. It dominates to an extent that makes the fact that pitchers are lousy hitters a fait accompli, and it means that the notion of balance between offense and defense for a pitcher is folly. The DH is admittedly an inelegant solution to this problem. It creates another position for which there is no offense/defense balance (although I don’t hold the ideal of offense/defense balance in particularly high regard). It is a solution that would have been unlikely to have been adopted in the early days of baseball had what I call the fundamental flaw been recognized as such. I could have included this in the "Silly Arguments" section, but thematically it fit better here--DH opponents sometimes use a slippery slope argument that the DH is a harbinger of two-platoon baseball. Even by the standards of slippery slope arguments, this one strikes me as awfully specious. The DH has been in existence for forty years; there have been no serious proposals to expand the DH beyond the pitcher. There are no other positions that exhibit an inexorable historical trend of declining production with each generation. Given the nature of the game, it is difficult to imagine that such a situation could ever occur. No defensive position is even comparable to the pitcher in terms of its influence on run prevention. I am all for continuing discussion about ways to tweak the DH; I’ve floated at least one of my own before. One option that is a non-starter as far as I’m concerned, though, is the notion of an eight-man lineup. While proponents like that it would remove the one-platoon DHs, it would fundamentally change the balance between offensive and defensive value for players of every position. It would instantly increase the incentive to carry defensive liabilities and make offensive production a more important factor in selecting players. The eight-man lineup would cause far more fundamental change to the game than the DH has. Instead of having one offensive position (DH) and one defensive position (pitcher) in which there is no tradeoff between offense and defense, it would tip the scales at the other eight positions more towards offense. Traditionalists would be aghast at the impact of all the extra plate appearances on the record book; that consequence wouldn’t bother me, but perhaps we could shift to eight innings to balance things back out. That last line is not meant as a joke. In the early 1880s, Henry Chadwick was convinced that baseball would soon be adopting a tenth fielder--a second shortstop of sorts, who’d play on the right side of the diamond and a tenth inning to go along with it. That never happened, of course, but it’s worth remembering that a number of things that we take for granted in baseball were once anathema to whatever version of "purists" were around at the time they were introduced. The defensive dominance of the pitcher, which was decried well into the 1880s by some people who were upset that fielding just wasn’t as valued as it once was, is one example. What was radical a generation ago is accepted now is tradition a generation from now. Feel free to argue against the DH, but you’ll have to do better than the tradition or real baseball cards, because they could have been played against you in the past, and will be in the future. 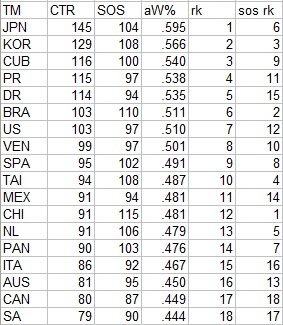 What follows is an attempt to use the WBC results over the first three tournaments to produce ratings for each team. Obviously there is a lengthy list of caveats that must be included with such a procedure, enough that I’ll begin with a basic disclaimer: these ratings are simply meant to provide some insight on which countries have had the best aggregate performances over the first three tournaments. They are not to be taken seriously as an analytical endeavor. They are not in any way intended to produce accurate ratings of the strength of each team in any given tournament or at any moment in time. * Due to the very small sample sizes inherent with a tournament like the WBC, I have chosen to aggregate results from all three tournaments. Obviously the makeup of the teams is nowhere near the same between 2006 and 2013, and while we can expect national team strength to be more stable than that of major league franchises, it by no means is a constant. 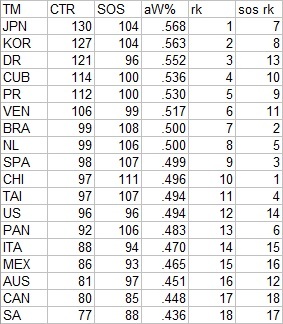 Even if national baseball strength was constant, the quality of the WBC roster would be highly variable. And I don’t think you would get a lot of disagreement if you posited that, say, the Netherlands has a much-improved talent level from the inaugural tournament. * Even after aggregating three tournaments, the sample sizes are still tiny. 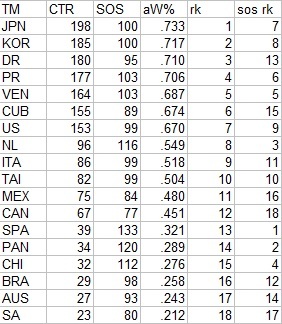 Japan leads WBC entrants with 24 all-time games, which represents less than a month of major league play. Thus any inputs will need to be heavily regressed to avoid ridiculous result. I am regressing by adding 69 games of .500 level performance (or some other W% as discussed later) to each team’s record, but this figure is based off the standard deviation of W% between major league teams rather than between WBC teams (given the limited sample of WBC play, I didn't want to make an assumption regarding the standard deviation of W% between WBC teams). Of course, we should expect a higher standard deviation of W% for WBC teams, and the higher the standard deviation, the less regression is necessary. Assuming that the necessary regression for major league play holds thus potentially results in excessive regression. * Expected W% (that is, based on runs scored and runs allowed) is not as useful of a tool for WBC play as it is for MLB due to the higher frequency of blowout games (particular as observed in earlier tournaments), the mercy rules, and the like. I could have done some sort of capping on run differential from a particular game, but I chose to keep it simple and just use unadulterated runs scored and allowed. 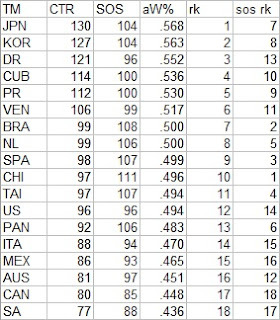 The Dominican sweep in 2013 enables them to slide past Korea for the best overall tournament record, although Japan’s EW% still towers over the other nations. 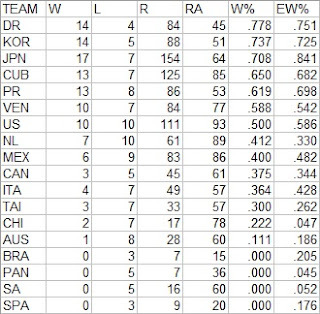 There is a pretty clear top seven that stands out, ending with the 10-10 United States; these seven countries make a nice group as they represent the only seven teams with a .500 or better W%, the only seven teams with a .500 or better EW%, and also pretty clearly represent the top baseball countries in the world (with apologies to Mexico and Canada). As you can see, the regression is very strong, serving to create a range of implied strength that is clearly more narrow than reality. There are also some important disclaimers to be made regarding countries that have only played in one tournament like Brazil and Spain--they rate much better than one would expect due to having only three games of actual experience to feed into the formula. Obviously a ranking that puts the 0-3 Spanish record ahead of the 10-10 United States leaves much to be desired. The key problems with these ratings are the sample size itself and over-regression. There’s nothing that can be done about the first issue, but there are two east ways I could seek to address the latter problem. One is to use a different regression weight besides 69 games. This would be appropriate due to the presumed higher variance in team strength between WBC teams compared to that observed in major league play. However, as I touched on earlier, it is difficult to develop a good estimate for WBC variance. Furthermore, simply changing the amount of regression does nothing to solve the larger problem--I am regressing all teams to .500. For analysis involving major league players and teams, this is a reasonable course of action since we can generally assume that all players are drawn from the same talent pool. In the case of the WBC, it is not an appropriate assumption. There is no reason we should assume that Spain’s underlying true talent is equivalent to that of Puerto Rico given what we know about baseball in these two nations. If we had the ability to observe enough WBC games, we could ignore this and still be alright, since eventually Spain’s .200 W% would overpower the regression weight. While Spain and Puerto Rico would still not be drawn towards the same center, the distortion would be limited. Given the sample size available here, though, the easiest way to handle this issue is to regress each team to a different level. Unfortunately, this introduces a great deal of subjectivity, as I must make these judgments. I have used a very simple approach--I have grouped teams into three buckets. The first is a .650 assumed W% and includes the group of seven countries mentioned earlier (Cuba, Dominican Republic, Japan, Korea, Puerto Rico, United States, Venezuela). The composite record of these seven in WBC play is 91-48 (.655). The second group includes mid-tier teams who will be regressed to .500. This group includes Canada, Italy, Mexico, the Netherlands, and Taiwan. The composite record of these five is 23-38 (.377). The final group is the other countries who will be regressed to .250; this group is Australia, Brazil, China, Panama, South Africa, and Spain. The actual record of this group is 3-31 (.088). 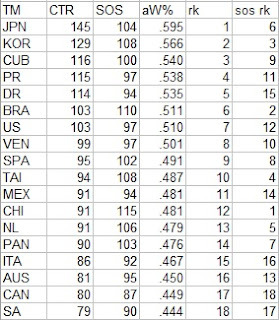 The values I’ve chosen are fairly arbitrary, but I believe the groupings are reasonable and match both WBC performance to date but more importantly our pre-existing knowledge of the baseball strength of each country. You’ll note that the regression complements don’t add to .500; this is not really a problem because the rating system inherently centers the average team to .500. Obviously this approach could be refined, but it should offer a reasonable adjustment, particularly when used with a system for which the “crude” disclaimer is already applied. 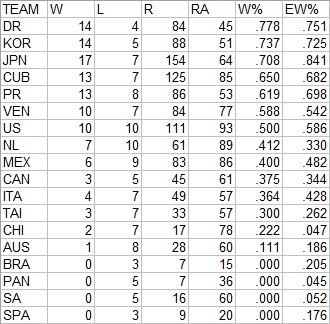 Thus, 14 of the Netherlands’ 17 WBC contests have been against the power seven, making their 7-10 record all the more impressive. Were I to bump them up to the .650 group and recalculate the ratings, the Dutch would move to #7 in the ratings, sliding just ahead of the United States. For now I’m more comfortable with them in the .500 group, but if the current wave of Curacao talent continues to develop and more follows, it may be past time to reassess the Netherlands’ place in the global baseball pecking order. I feel a little bad about this one since it's such an unusual situation. I'm sure Yahoo! is not the only outlet that can't render this sequence of events correctly...but still. One of my favorite things about baseball is keeping score. I like keeping score enough that I feel compelled to attempt to devote at least one post annually around Opening Day to some aspect of the practice. It is somewhat common to find paeans to the aesthetic elements of scorekeeping. I would be lying if I claimed to not share any of those feelings (and this would give me up if I tried), but it’s not my favorite format, so instead I will focus on some more utilitarian aspects of scorekeeping. Namely, I’m going to briefly discuss my preferences on a number of aspects of scorekeeping. Please allow me to issue a disclaimer up front that the manner in which I do things is not “correct”, nor better than what others may do. Scorekeeping, so long as it is only being done for your own consumption and not for any sort of official record, is whatever you want it to be. There is no right or wrong way to go about it, only what works for you. The discussion that follows is a bit jointed, as I’ve broken it into discrete pieces related to a specific aspect of scoring, even though some of the distinct points are related philosophically. 1. Traditional - each plate appearance is represented by its own scorebox, in which the actions of the batter is recorded, including whatever he does should he reach base. 2. Project Scoresheet - the account of the game is kept in an entirely linear fashion so as to facilitate entering the play-by-play into a computer system. Any baserunner advancement is recorded in the box of the plate appearance in which he advances, making it a chore to tie back to the individual baserunner. 3. Situational - this method, developed by Alex Reisner, is something of a hybrid between the traditional and Project Scoresheet systems. Recopying of baserunner locations is sometimes required, while baserunner actions are tied back to the responsible player through use of uniform number (or lineup position in some variations). I don’t find backtracking to be a nuisance, and think that grouping all of the actions of a particular player together makes good sense as the individual nature of the game makes it desirable to be able to quickly identify each player’s performance. And it’s not as if you have to go back to scoreboxes that were initially filled out innings ago--the maximum lookback is to five batters earlier. Of course, this discussion is limited to offensive performance--pitching and fielding results are necessarily scattered all over the opponent’s side of the scoresheet. If you decide to use the Traditional scoring method, the next big question regarding the layout of your sheet is whether to put any pre-printed marking in the scoreboxes. The most common is a diamond used to trace the batter-runner’s progress around the bases. However, I prefer no pre-printed markings--no diamonds, no ball/strike boxes, and certainly no position numbers printed around the diamond or the “multiple choice quiz” of how the batter reached base (as Bill James so fittingly called it). To me, the visuals just aren’t helpful. I like having maximum freedom to record what I need in the box, without having to fit that information in around the markings. When the batter doesn’t reach base, which of course is around 2/3 of the time, there is no need for a big diamond which has to be written over. When the batter doesn’t reach base, as many others do, I mentally divide the scorebox into four corners and trace his progress counterclockwise starting from the lower righthand quadrant. Diamonds are nice if you need to quickly track runners around the bases and don’t care much about how or why they advanced to each base (a little league game or slow pitch softball come to mind). But when I’m scoring a game, I still want to know how each runner got to the base, which requires some kind of notation in addition to simply tracing the diamond. Thus, tracing the diamond requires additional pencil strokes plus uses up some of the room in the scorebox that might be used to record the means of advancement. I have been tracking pitches when scoring for almost as long as I have been scoring. The only time I don’t do it is in those circumstances in which I know I will not be able to devote my full attention to the game and thus the probability of an error has increased. However, even that has become less of a consideration in the era of GameDay, where for any major league game you can quickly catch up or clarify anything you may have missed. Having a record of the count (and sequence, as well as the type of strike--swinging, called, foul) makes your scoresheet a much more complete record of the game, and that’s enough justification for me. However, it is understandable that some folks don’t want the added burden that comes with recording every pitch. What is odd to me is that you will sometimes see comments from a segment of serious scorekeepers that tracking pitches is only for crazy people. I have not found tracking pitches to be in any way a nuisance. I’ve done it so much that now, on the rare occasions in which I am not tracking pitches, I find myself distracted during the course of an at bat, wanting to write something down but realizing there is no place on my scoresheet on which to do it. And as you gain experience, scoring tends to become second nature regardless of the detail level--after some practice, I think you’ll find you are still able to talk to your friends or eat a hot dog or whatever activity you’re afraid will be disrupted. Many of the more recent scoresheet designs, like Project Scoresheet and Situational, have eschewed the use of nine columns, one for each inning. This allows for larger scoreboxes, but you lose the very clear organization by inning that the traditional format provides. My preference is to stick with tradition so as to see all events clearly on the inning level (just as I want to be able to see all events clearly when broken out by offensive player). It’s true, though, that a lot of space is wasted by doing so. Giving each batter a spot to bat in every inning results in 81 scoreboxes, of which only 38 will be used in the average major league game. Allowing for six plate appearances for each batter is usually more than enough for nine-inning games. One thing I do to maximize space is to eschew any columns for batter statistics at the end of the game. Many people don’t fill these out even if they are available, and from my perspective it is just busy work. I am not the team statistician, and if I can look up the boxscore on line very easily (even if you can recreate the scoring from a gametracker, it is not in a format conducive to easy readback. When a team bats around, I simply continue scoring in the next column and draw a heavy line to indicate where the previous inning ends and the inning that is actually supposed to be scored in that column begins. I typically only have nine innings columns on my scoresheet (so as to maximize space), so renumbering the columns is not an option. I’ve never understood the impetus for that practice, though--to me it’s an overreaction for what is generally a one or two batter nuisance. The traditional scorekeeping approach indicates a throw with a dash (i.e. 4-3). The Project Scoresheet system eliminated this use of the dash, and I adopt this approach wholeheartedly. Not only does it save a pencil stroke and clutter, but it frees up the dash symbol to be used for other purposes. For me, the dash is a symbol of a deflection, so 1-63 is a ball deflected by the pitcher on which the shortstop goes on to retire the batter at first. Similarly, I don’t use a F to indicate a flyout (i.e. F7). If I just mark 7, I know that this is a flyball caught by the left fielder. If it is something more unusual (such as a line drive, a foul, or a sacrifice fly), then I can note this using some other code, but I see no reason to note the mundane. Simple #2 Bic mechanical pencil with .5mm lead. I bought a pack of five of these pencils in 2004 and am currently on pencil number three (with many lead refills along the way, of course). They are simple, no fuss pencils. The continued use of traditional wooden pencils personally mystifies me (not just for scorekeeping but any application). Scoring in ink is nice as it offers some permanence (although my pencil scoresheets from fifteen years ago appear to be holding up just fine), but I like the ability to erase with ease that pencil provides. It’s hard not to make a few slipups when scoring a game, especially if you want to match the official scorer, who will sometimes change his mind.